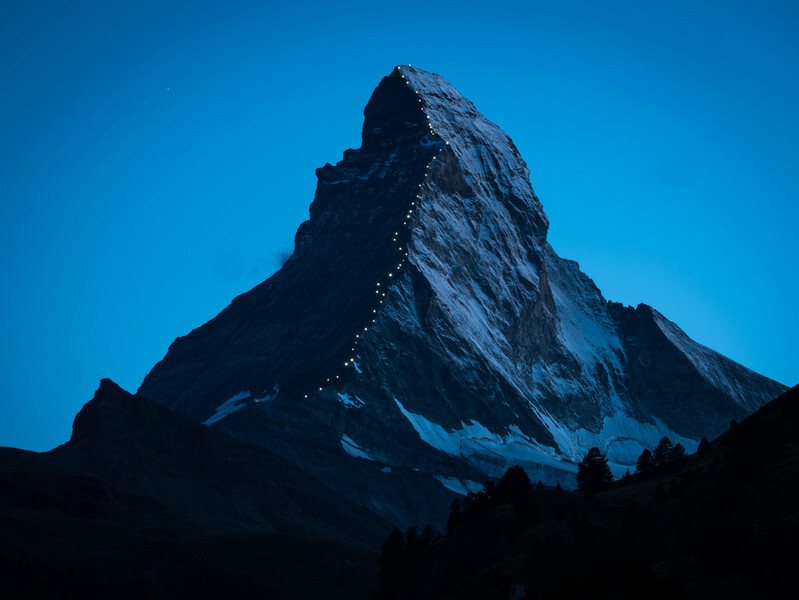 Matterhorn at dusk, with the route of the first ascent illuminated by 50 lamps (not all are visible; a red one should indicate the location where four of the first climbers fell); Zermatt, Switzerland. Before our recent holiday, I had never been to Zermatt and only seen the Matterhorn from far away summits. For four days, I could see it from my bed - what a view to wake up with! This year is a special year for Zermatt and the Matterhorn, because it was 150 years ago, in 1865, that it has been (semi-) successfully climbed the first time (four out of seven climbers died on the descent). It was one of the last 4000 m summits of the alps to be conquered! Although photographs of this remarkable summit are omnipresent, at least in Switzerland and especially during this year, the sight in person, from Zermatt, is still irresistible. And despite the many photographs and little chance to contribute a new and interesting composition, I "had to" photographs this iconic mountain. Sometimes it is not important how many people have already photographed a subject, but just a pleasure and wish to do it yourself. At the moment and in honour of the anniversary of the first ascent, a light installation traces the route of the first climbers with 50 solar-powered led lamps, which added a surprising element to the composition above. At dusk, the lamps light up one by one, for three minutes all lamps shine, and then they are switched off. The spectacle is repeated several times during the night and is, in my opinion, a really felicitous and elegant project. The photograph above is my most preferred capture of this light spectacle and by far the Matterhorn composition that I like the best (of those that I created). Note that not all lamps are visible from this point of view; most notably a red lamp that indicates the place where the four climbers fell down. 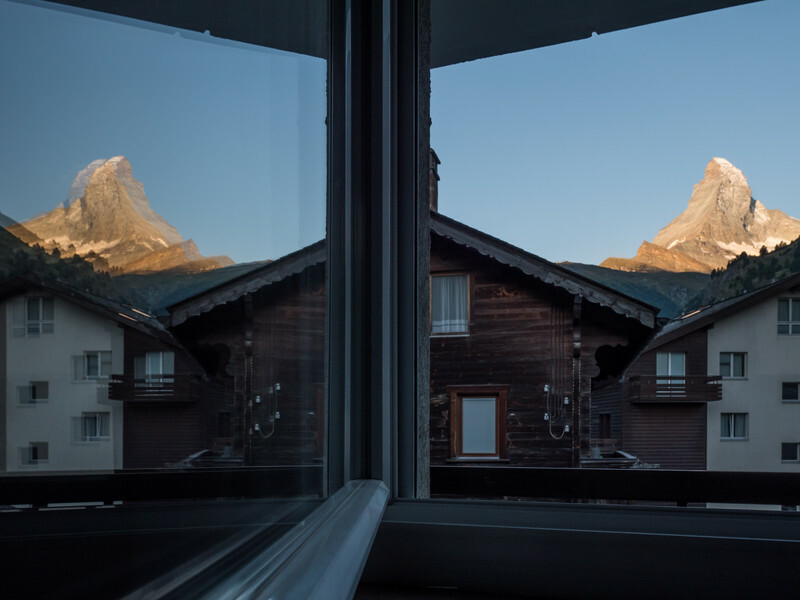 Two matterhorns - the view from our bedroom (only for four days, unfortunately)! The second photograph, above, is a composition, that I had imagined before, but that did not work out as envisioned. Either the summit was hidden by a cloud, I forgot, or I did not find a suitable reflective surface to photograph two Matterhorns in one photograph. The composition shown here is the best, but I am certain that it could be improved significantly. Finally, the sunset and cloud compositions that follow are, in my opinion, decent Matterhorn documents. I like the positioning and dynamics that the clouds create in the last picture; it seems to me that the clouds dwarf the summit. All photographs except the first one have been taken with the Lumix GX8. 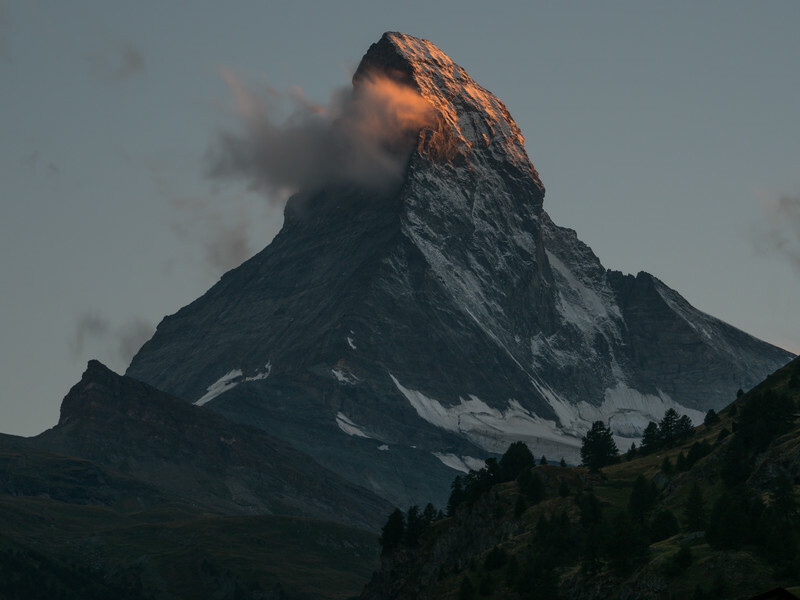 The last sun rays reach the summit and the top of the north face of the Matterhorn; Zermatt, Switzerland. 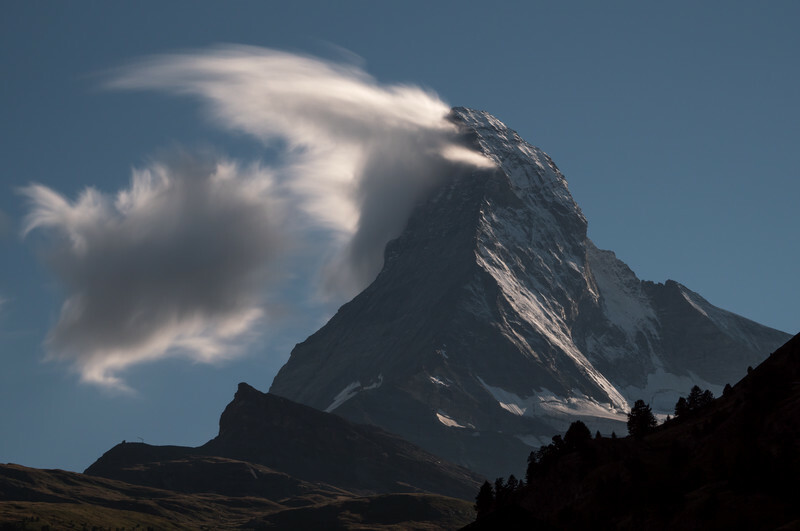 Clouds blowing around the Matterhorn; Zermatt, Switzerland. I totally agree with you on the 'had to' take the picture thinking. Hard to a completely original angle on something these days but why should that stop from taking it?! Love the window reflection shot! That seems like a new angle on it. Oh and the cloud kissing the peak at sunset. Great stuff. Thank you very much for your visit and nice comment!